Floodwaters from Hurricane Ike surround houses near Winnie, Texas. Hurricane Ike made landfall Saturday near Galveston causing widespread wind and flood damage along the Texas and Louisiana coasts. The death toll from Hurricane Ike rose to 21 in nine states Sunday, as rescuers said they had saved nearly 2,000 people from waterlogged streets and splintered houses. Glass-strewn Houston was placed under a weeklong curfew, and millions of people in the storm's path remained in the dark. 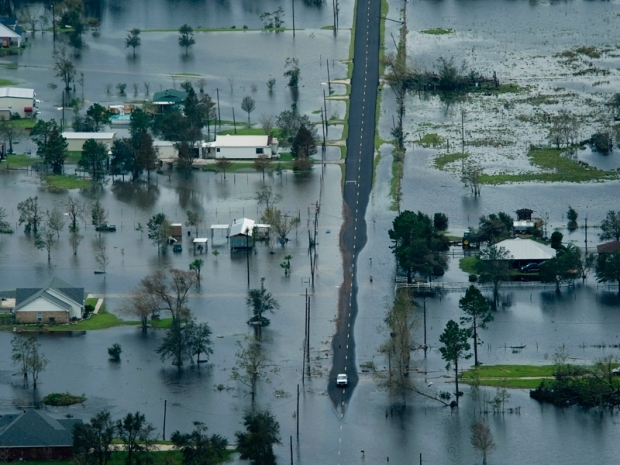 As the floodwaters began to recede from the first hurricane to make a direct hit on a major U.S. city since Katrina, authorities planned to go door-to-door into the night to reach an untold number of people across the Texas coast who rode out the storm and were still in their homes, many without power or supplies. Many of those who did make it to safety boarded buses without knowing where they would end up, and without knowing when they could return to what was left of their homes, if anything. "I don't know what I'll be coming back to. I have nothing," said Arma Eaglin, 52, who was waiting for a bus to a shelter in San Antonio after leaving her home and wading through chest-deep water with nothing but her clothes. "I'm confused. I don't know what to do." The hurricane also battered the heart of the U.S. oil industry: Federal officials said Ike destroyed a number of production platforms, though it was too soon to know how seriously it would affect oil and gas prices. Two million people were without power in Texas, Arkansas and Louisiana. Of the 21 dead, five were in the hard-hit barrier island city of Galveston, including one body found in a vehicle submerged in floodwater at the airport. Many deaths, however, were outside of Texas as the storm slogged north. Ike's 110 mph winds and battering waves left Galveston without electricity, gas and basic communications — and officials estimated it may not be restored for a month. "We want our citizens to stay where they are," a weary Mayor Lyda Ann Thomas said. "Do not come back to Galveston. You cannot live here at this time." Authorities said Sunday afternoon that 1,984 people had been rescued, including 394 by air. In addition to people who were literally plucked to safety, the figure includes people who were met by crews as they waded through floodwaters trying to get to dry ground. Still others chose to remain in their homes along the Texas coast even after the danger of the storm had passed. There was no immediate count Sunday of how many people remained in their homes, or how many were in danger. The Red Cross reported 42,000 people were at state and Red Cross shelters Saturday night. The search-and-rescue effort was the largest in Texas history, including more than 50 helicopters, 1,500 searchers and teams from federal, state and local agencies. From the city of Orange alone, near the Louisiana line, more than 700 people sought dry ground — "a Herculean effort to organize a reverse evacuation that nobody had ever planned for," Mayor Brown Claybar said. Hundreds of people wrapped around a high school in Galveston, some with pets, overstuffed duffel bags and medicine as they waited to board a bus to a shelter. Some didn't know where they were going, and even more didn't know when they could return. "I have nowhere to go," said Ldyyan Jonjocque, 61, waiting for a bus while holding the leashes of her four Australian shepherd dogs. She said she had to leave two dogs behind in her home. She wept as she told of officers rescuing her in a dump truck. Rescue crews vowed to continue the search until they had knocked on every door, and planned to work through the night for the second day in a row. They were helped by receding floodwaters, but there were constant surprises as people rowed and sloshed through towns. Two people who took a flat-bottom boat to check on a funeral home in the city of Orange passed by the local cemetery and found dozens of caskets had popped above ground in the floodwaters. Only a chain-link fence kept them from drifting into the surrounding neighborhood. "I haven't seen any bodies, just caskets," said one of the men, Warren Claybar. The storm also took a toll in Louisiana, where hundreds of homes were flooded and power outages worsened as the state struggles to recover from Hurricane Gustav, which struck over Labor Day. In Hackberry, La., about 15 miles from the coast, workers moved a large shrimp boat out of the highway with a bulldozer, but the team had to stop because of strong currents in the floodwaters and difficulty in seeing the roadway. Ike, which killed more than 80 in the Caribbean before reaching the U.S., has killed seven people in Texas, including a 4-year-old Houston boy who died of carbon monoxide poisoning from the generator his family was using for power. Two people died in Louisiana. President Bush made plans to visit the area Tuesday. On his trip to Texas, Bush said he intends to express "the federal government's support — sympathy on the one hand and support on the other — for this recovery effort and rebuilding effort." The oil industry was trying to find out how severe damage was to at least 10 production platforms destroyed by the storm. Specifics about the size and production capacity of the destroyed platforms were not immediately available, but the damage was to a fraction of the 3,800 platforms in the Gulf. By comparison, Hurricane Katrina destroyed 44 platforms. As the remnants of the hurricane broke down and streamed northeastward, torrential rain caused flooding and power outages in parts of Kansas, Missouri and Illinois. More rain fell in Chicago on top of 6.6 inches Saturday, and work crews placed 30,000 sandbags along the Chicago River, which was 2 feet above its normal level Sunday. Forty people in suburban Albany Park had to be evacuated by boat. SWAT commander Sgt. Rodney Harrison and five other members of the Port Arthur Police Department drove a 2½-ton truck into the waters to search for victims in Sabine Pass near the Louisiana border Sunday morning. The waters were so intense and the roads so blocked that a gear shift broke off in the driver's hand. After two hours of struggle, the team had little to show for their work other than sopping wet clothes and exhaust-streaked faces. They even dodged an alligator. "You have people that have families at home who put their lives on the line to come out here and save somebody that made a bad decision," Harrison said. "I don't think that's right. I don't think that's fair to everybody." Houston, the nation's fourth-largest city, was reduced to near-paralysis in some places. Power was on in downtown office towers Sunday afternoon, and Texas Medical Center, the world's largest medical complex, was unscathed and remained open. Both places have underground power lines. Ike was downgraded to a tropical depression as it moved into the nation's midsection and left more harm in its wake. Roads were closed in Kentucky because of high winds. As far north as Chicago, dozens of people in a suburb had to be evacuated by boat.